We’re sorry you're having trouble signing in. 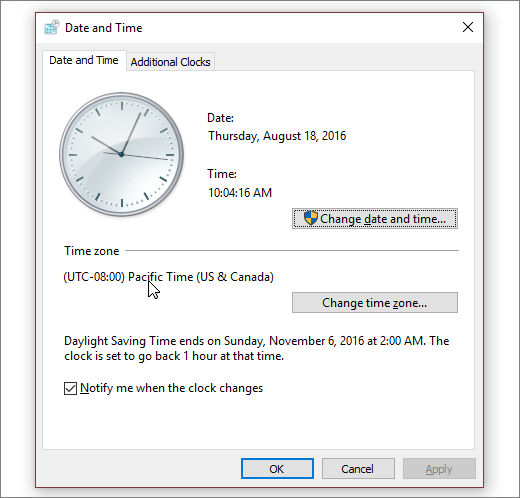 Let's get Skype for Business working again as quickly as possible. Need help signing in on a Windows PC? Check the format of your sign-in address. It should look something like KatieJ@contoso.com. Be sure to use your organization credentials, not your Skype Name or Microsoft account. Your sign-in address may be different from the format you use to sign in to your organization’s network. You may be asked for both a user ID and a sign-in address. For most organizations, these two are the same, so enter your user ID in both boxes. 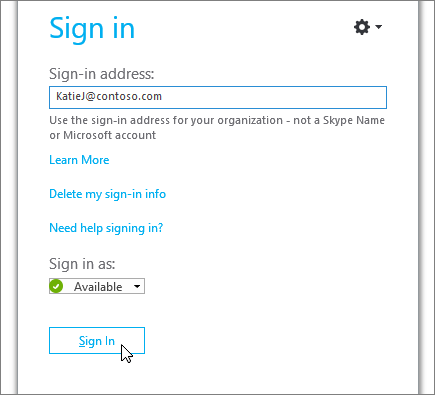 Note: If you're signing in to Skype for Business for the first time, enter your Office 365 user ID, click Sign In, enter your password, and click Sign In again. On the Skype for Business sign in screen, click Delete my sign-in info. Note: If you're stuck at "Contacting server and signing in," click Cancel Sign-In. In the window that appears, click Yes. Under Password, enter your password, and click Sign In. In a browser, go to Office.com. In the top right corner of the screen, click Sign in. 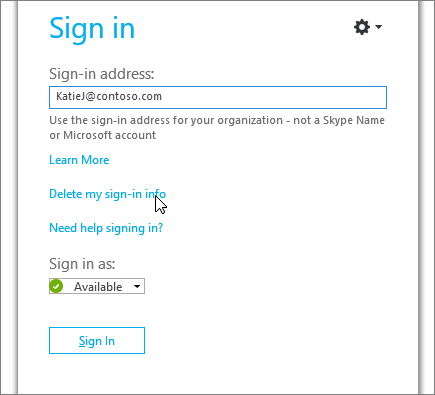 Enter the sign-in address and password you use to sign in to Skype for Business, and click Sign in. If you can't sign in to Office 365, your password might be incorrect. Try resetting your password. If you’ve forgotten your password or it’s no longer working, use the Microsoft Online Password Reset site to send a new password request to your workplace technical support—typically the person who set up your Office 365 account for you. 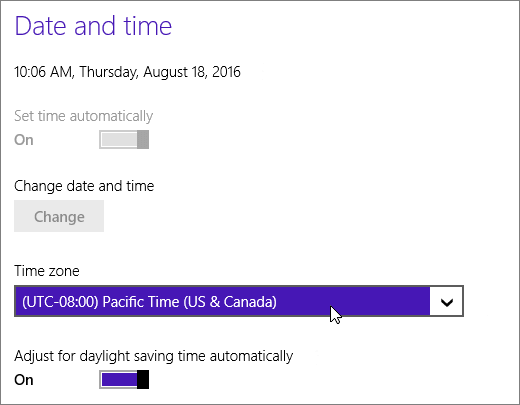 Go to a website that shows Coordinated Universal Time (UTC). Still getting an error message? There are a number of technical reasons why this might happen. Wait a few minutes and try to sign in again. If that doesn't work, contact your workplace technical support and provide a link to this page: Troubleshooting Skype for Business Online sign-in errors for administrators. Something is preventing authentication. Wait a few minutes and try to sign in again. If that doesn't work, contact your workplace technical support and provide a link to this page: Troubleshooting Skype for Business Online sign-in errors for administrators. Need help signing in on a Mac? How do I sign in to Skype for Business on Mac? 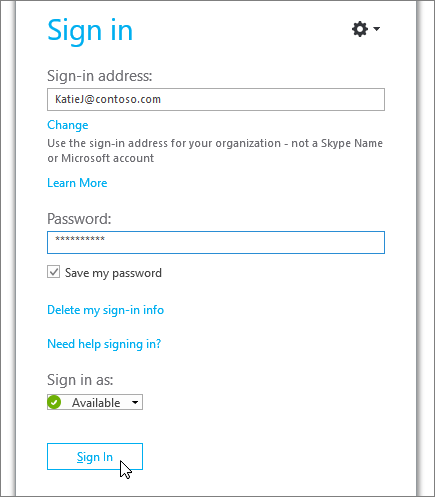 You need a sign-in address and password from an organization that has a Skype for Business or Lync license. If you’re already using Skype for Business on your desktop, then you can sign in with the credentials from your work or school account. For more information, see Sign in to Skype for Business. What’s the format of my sign-in address? Your sign-in address looks like this: username@domain.com. You might be asked for both a user name and a sign-in address. If you are a Skype for Business Online user, use username@domain.com. Otherwise, use domain\username. If you have questions about your sign-in address, contact your workplace technical support team. If you need to enter custom proxy settings, on the sign-in page, click Advanced Options, and then enter the proxy information. Need help signing in on a mobile device?